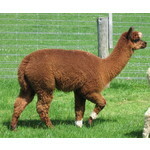 Flagstaff Alpacas offers a large number of females for sale and the following list is a selection from those available. With a herd of over 150 females we ask you to make contact for details of other females that suit your herd choice. Flagstaff Alpacas 'pregnant females' include a certified birth guarantee. We can arrange delivery to anywhere in New Zealand within 60 days of agreement. 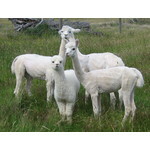 Package of ten juvenile white and fawn alpaca females priced to sell. Export quality, all these girls are aged 24 months to 36 months and price includes delivery anywhere in Otago and Southland. Price: NZ$5000. Bundle (five) of multi-coloured (mixed coloured) and solid coloured young alpaca females. All are aged between 8 and 10 months and come in a variety of colours. They will require 1 to 2 acres of pasture. Helen (IAR: 1004280) is a solid white female with her top genetics recognisable in her confirmation and her fleece statistics. Here seventh fleece (Dec 2015) was rich, lustrous and had a mean of 21.5 micron, SD of 4.2, CV 19.4, Comfort Factor 98%+. 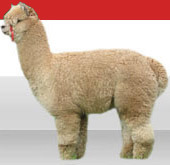 Recently third in fleece category at National Alpaca EXPO 2012! She is due January 2016 - shorn 3 Dec 15. White Sox is a solid and pregnant female - born 15 January 2012. Mum White Sox is a dark brown in colour, with white markings, this cute female alpaca comes from reliable line of breeding stock. Price: $1000 including GST.